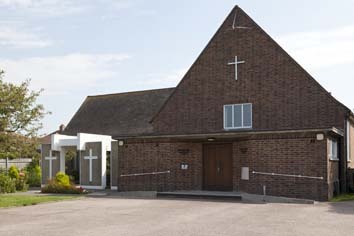 The small church was built in 1953 in a newly developed area within the parish of St Mary Hampden Park (Church website). It has low buff brick walls with square-headed windows of a domestic character, combined with steep, high roofs, covering both the church and the hall to which it is attached. Though lacking a tower, its purpose is apparent from the prominent cross on the main front. In front of this is a broad flat-roofed structure for the entrance, which is lacking in windows. The dedication is derived from the demolished church of St Peter, Meads. 1. 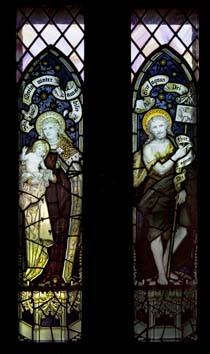 (Two two-light north nave windows) C E Kempe, 1900, removed from St Peter, Meads (Collins p302). It is immediately apparent that the glass has been altered to fit the square-headed windows of the new church. 2. 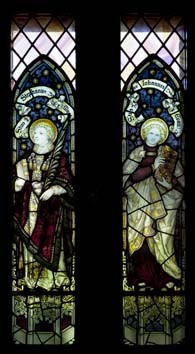 (East window and south nave window) Kempe and Co, 1907 and also from St Peter, Meads (ibid). An unusual feature of the east window for this maker is the way the unusually prominent bands bearing the inscriptions are incorporated in the surrounds. 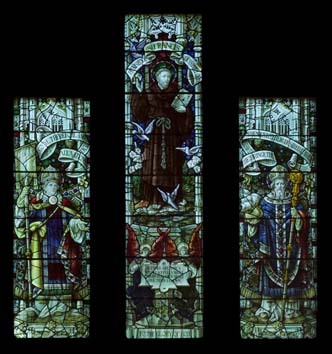 My thanks to Nick Wiseman for the photographs and some comments on the Kempe glass.